The Durham Economy TV Stand is nothing but quality construction. This stand has a beveled top, while the two doors have raised panel frames. The front of the base is arched, but the other sides are plain top to bottom. This TV stand looks good anywhere. This Durham Economy TV Stand has an opening for your consoles and media players, as well as two raised panel bottom doors. Other features include a beveled top and an arch in the front of the base. This is a handcrafted TV stand in a classic style. With its triangluar sides, this TV stand is contemporary and minimal. Indeed, its waist-height shelf is the right depth for a flat screen. Angled front legs mean the middle and bottom shelves gradually deepen, while providing ample ventilation for electronics. This TV stand proves that ultra-modern decor has options in solid wood. The Artesa 2 Door TV Stand is a Shaker style TV stand with sturdy tapered legs, arches supporting the sides, and matching arched window mullions in the sliding glass doors. Corbels support the corners of this heirloom TV stand's beveled top. 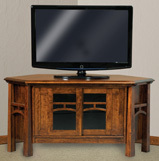 Use our drop down boxes at the top right of the page to select your options for this solid wood corner TV stand. The Artesa 3 Door 2 Piece Media Cabinet brings the solid wood look to your living room from floor to ceiliing. This cabinet has small corbels supporting the top, and arched trestles supporting the shelf. The legs of both the open hutch and the closed TV stand are tapered from feet to top. The TV stand has a beveled edge with corbel supports. Arches support the legs at the sides, while the same arch decorates the glass sliding door as a mullion. The other two doors have reverse panels. The Artesa combines straight lines with arches, making a rich statement in a houshold adorned with heirloom furniture. The Artesa 3 Piece TV Wall Unit with Bookcases stores all your media and electronics in beautiful hardwood style. With glass doors, the towers showcase your books, media or trinkets while covering them for a finished look. Arched mullions in the glass match the arches in the sides. Contrasting wood bottom doors allow the eye to remain focused on the glass above. The legs of the Artesa barely taper, widening to the feet. Small corbels support the top, with the center unit extending taller and forward from the sides. This unit has an open shelf above the TV and two cubbies just below. Long lines and subtle detailing let the Artesa's heirloom quality decorate your living room. Watch TV in Shaker style with the Artesa 36'' High TV Stand. This TV stand has a beveled edge on top with small corbels supporting it. The legs each follow a subtle A-line, while each side has a decorative arch. Paneling styles two of the doors while the central door has arched mullions to match the sides. The two flush drawers are elegant. With solid wood construction, the Artesa TV Stand is made to be an heirloom. The Artesa 63'' 3 Door TV Stand has a beveled top with corbels supporting the corners. The legs slowly broaden toward the bottom. Arches decorate the sides and sliding front window, while the other doors contain minimal reverse panels for an elegant look. The Artesa 72'' 3 Door TV Stand has two paneled sliding doors on either side of a glass sliding door with an arched mullion. Trestles the same shape as the mullion support the tapered legs from the sides. A beveled edge tops off this hardwood stand. This solid wood stand is built to last, so its Shaker style elegance makes it enough of a classic to complement a home that will grow and change with the years. The Boulder Creek 6 Piece Wall Unit with Adjustable Bridge is the ultimate entertainment center to keep all your electronics and media. This handcrafted unit has inlaid detailing in the arched top and bottom skirts. The unit is carefully shaped, curving out from the top and then straight down. Reverse side panels enhance the curves. Three drawers on each tower, as well as two of the central drawers, boast reverse panels. The glass tower doors and central door are mullioned to complement the whole unit's curved frame. The many details that comprise this TV unit showcase its heirloom quality. The Boulder Creek 2 Piece TV Stand includes a TV enclosure with a shelf that goes on top of the TV stand. We like these enclosures because it protects the TV's, adds some shelf space, and makes the whole unit grand in appearances. Additionally, you will find nicely curved raised panel sides, smoked glass, an adjustable shelf behind each glass door, and a smooth sliding track that all doors slide on and allow easy removal if needed. Add a touch light feature that can be installed in the shelf above the TV area. Use our drop down boxes at the top right of the page to select options for your Amish TV stand. The Boulder Creek 3 Door 2 Drawer TV Stand has a thick beveled top and curved, paneled sides. The central door is paneled while the two side doors have glass half-arches mirroring one another to create a full arch. The bottom drawers also have recessed panels, while the arched front skirt has elegant walnut inlays. This handcrafted TV stand is in the Shaker style to complement a classic home, but its broad curves suit it best to a space of warmth and luxury. Add the Boulder Creek 48" TV Stand to nearly any room for a contemporary look and feel. The Boulder Creek series looks stunning when matched up with the modern, sleek look of any of today's TV's. Check out the sharp look style features from it's smoothly curved sides, raised panels, and smoked glass. An adjustable shelf behind each glass door, and a smooth sliding track mechanism the doors slide on also allow for easy door removal. The Boulder Creek series is one of our favorite styles for TV stands, and the Boulder Creek 63 stand is the big brother amongst them. We love it for it's uniquely styled and contemporary features such as the 90 degree raised panel sides, curved corners, and smoked glass. It's practical features will not dissappoint either, with an adjustable shelf behind each glass door, and a smooth sliding mechanism for the doors that allow for easy removal. Most importantly, plan on this TV stand to last for decades since it's handcrafted with hardwoods by highly skilled Amish craftsman. This Boulder Creek TV stand has been fashioned to a unique size that has more built in height, allowing for your TV to also be higher from the ground. This is great for higher seating arrangements, and also allows for more storage space beneath the surface for media or electrons. The Boulder Cree 63" x 36"h still has all the same great features as the rest of the Boulder Creek line. Gracefully curved leg corners, raised panel sides, smoked glass doors, an adjustable shelf behind each door, and a smooth operating slide mechanism for the doors, which allows for easy removal. The Boulder Creek 72'' 3 Door TV Stand has a flow to its overall look. From the beveled edge top, the legs and sides curve down. The vertical reverse panels further showcase the curves of the sides. In front, reverse panel sliding doors combine with a mullioned central door to create one arch. All the base skirts are arched as well. Inlaid ebony in the front skirt adds a finishing touch. The boulder creek's design and careful details express handcrafted style.